What is the counterexample in modal system K for “⬜A ➡A”? There is no contradiction in w0 and I have no possibly operator allowing me to continue the tree into a new world. Because the accessibility relation is not reflexive in K, I cannot derive A in w0 to reach a contradiction that I would be able to in modal system M.
The truth tree remains open, implying that I cannot show "⬜A ➡A" in K. However, when I try to find a counterexample in K, I am stuck. v(A) = 1. If that is the case then "⬜A" is 1 and so is "A" which means the conditional is true. So that valuation does not lead to a contradiction. v(A) = 0. If that is the case then "⬜A" is 0 and so is "A" which means the conditional is again true. I don't see how I can construct a counterexample in K. That counterexample should also work as a counterexample in M where this can be derived. Perhaps being invalid does not mean I can always create a counterexample, but without the counterexample is it really invalid? You are reading □A as a claim "A is true in every possible world" and inferring "A is true in the actual world" would be a logical consequence of that. Rather, in Kripke's semantics, □A is read "A is true in every accessible world (with respect to a current world)". 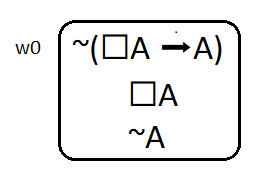 The axioms of the various modal logic systems establish requisite properties of the accessibility relations. In system K there is no axiom requiring any world to access itself (i.e., an accessibility relation may not be reflexive in K). So in K it is allowed that you may have a frame where a world (w0) does not access itself, A is false there, but true in every world that is accessible from there. That is the counter example. That is also your diagram. Not the answer you're looking for? Browse other questions tagged modal-logic truth-tree or ask your own question. If I cannot draw a world in a truth tree in modal logic does that mean that no other worlds exist for that statement? What is modal logic for? What are the prerequisites for studying modal logic? What is necessity in modal logic? What is the justification for closing a whole branch in a modal truth tree diagram if there is a contradiction in only one world? Why can one not draw a world in modal logic given necessity?